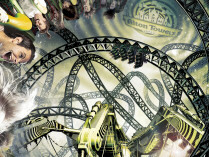 Alton Towers' new roller coaster is to have more inversions than any other in the world. In a most unusual twist in the lead up to The Smiler's opening, confirmation for the number of inversions on the ride came on a packet of Kellogg's Krave cereal! Promotional packs state the "world's first 14 looping roller coaster" claim on the back of the box. Additionally Krave will be running a competition from June to September to win tickets and all-inclusive VIP packages to the resort. We expect that having such a world's first will bring a large amount of media attention when the ride opens, and be a massive draw to visitors who want to try a roller coaster with this many inversions. But, when exactly can we ride The Smiler? "Lots of questions about #TheSmiler opening date, we'll hopefully be letting you know at some point this week! Nearly time to #GetCorrected"
This is more than likely to be revealed through the cryptic videos that have appeared recently, first on YouTube, then on the official Smiler minisite. Keep an eye out on these, and see if you can put together the clues. Over at the construction site, the track is now complete, and the ride has begun to test. A games stall and ride photo cameras have been installed, and the Marmalizer is also undergoing testing. It seems that we are not far off getting an opportunity to ride The Smiler. Are you ready to "Get Corrected"?